I have been beading for almost 20 years, but my creativity has been evident all my life from making outfits for my dolls as a child to cooking and gardening as an adult. I spent many years working in science, but the creative side of my brain kept looking for ways to be let out. In 2005-2006, I participated in NanC Meinhardt’s 13th Master Class, a class designed to find your artistic voice, sponsored by Creative Castle in Newbury Park and Kandra’s Beads in Solvang. 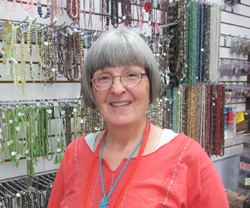 I now work and teach at Creative Castle as well as other bead stores in California. The journey with beads continues to play an important part in my life. 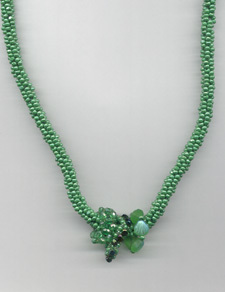 I want to turn the craft of beadwork into the art of beadwork….one bead at a time. 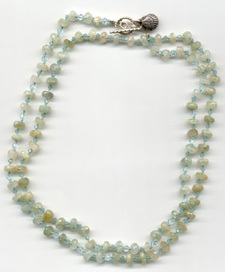 Beads allow me to express my thoughts and feelings in new ways and they provide a vehicle for self exploration. It is a process that centers me, slows me down, and focuses me on telling my story. Ideas come to me from many sources, including personal experiences, nature, daily life, life around me, what I am reading. Specific words, phrases, sights or music capture my imagination and soon I am seeing them through and with beads. Translating these inspirations into beads with the many available techniques and the endless color and texture of the beads is the challenging, but fun, part. The beads often tell me which direction to go. - December 2 – 30, 2007: Absolutely Beads 2007 at Beads and Beyond, Bellevue, WA.